Yakima Athletic Club has an array of aquatic classes and programs for children and adults. Descriptions and offerings below. View the current Aquatics Schedule. This 45-minute class utilizes moves from Tai Chi, Yoga and Pilates as well as water aerobics and provides a gentle workout utilizing the body’s core and emphasizing range of motion and balance exercises. A brief cardiovascular training segment is included to the exercisers’ tolerance. This class is designed to be low impact and suitable for all ages and abilities including those recovering from illness or surgery, those with arthritis or other physical challenges. A gentle, low-impact 45-minute water class using stretching and yoga to achieve a mild cardio workout and an excellent full body stretch. Wonderful for new exercisers or those wishing to work on balance, posture and flexibility. A gentle, low-impact 45-minute water class using all water walking movements to achieve a mild cardio workout. Equipment may be used for a short time to increase strength. A short abdominal strengthening and stretching section will balance out this workout. A good entry-level class for the new exerciser or the person who needs a low-impact workout. A 45-minute class combining low, moderate and high-level exercises and equipment to improve your cardiovascular system, muscular strength, core stability and flexibility. The participant can modify the movements to his or her needs. A 45-minute challenging class designed to increase your strength and power, using equipment and body weight resistance. Appropriate for all fitness levels and modifiable for any participant - come get fit in the water! Want to hone your stroke to be able to swim longer and stronger? Haven't quite mastered your fear of the water yet? Join in a great class geared to the adult who wants to learn to swim comfortably. Basic stroke technique is taught. Contact Aimee Ozanich, Aquatics Director at 509-453-6521 x208 for more information. Semi Private: $210 for 6, 30 minute lessons. Class is 25 hours in length plus online modules. Attendees certified in the course will be considered for future employment. We offer Red Cross lifeguard training classes. This is a 24 hour in-class/water course with approximately 8 hours online that must be completed after registration and before the first class session. Contact Aimee Ozanich, Aquatic Director 453-6521 x208 for questions. Registration is open now and closes two days before each class begins. Attendance at all class sessions is required. Online training prior to start of class is required approximately (8 hours). 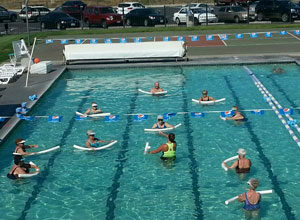 Last class before Summer: First two weekend of June-class location Naches Pool. $38 Red Cross registration fee: pay the Red Cross when registering for online work - certification cannot be completed until Red Cross fee is paid. $150: pay at Yakima Athletic Club at first class - includes supplies. Optional: $40 books physical book purchase, available free online. Washington State Law states: Children 14 years of age or younger, can only use our aquatics facility during Lifeguard Hours. A responsible adult, 18 years of age or older, shall accompany the children and be in the pool or on the pool deck at all times the children use the facility. When the pool is used by persons from 15 to 17 years of age, at least two people 15 years of age or older must be in the pool or on the pool deck at all times the persons use the aquatics facility. A lifeguard does not have to be present. Persons age 18 and older may use the aquatic facility during business hours. See Aquatics Schedule for available times. Adult swim lap lanes are available throughout the day. When multiple users are in each lane please circle swim so that more than two users can use the pool. Proper etiquette procedures are to enter the lane, wait and talk to the current user, confirm circle swim and start your workout.